The records are to be presented on three shelves that are fixed to a wall. Under each record the (included) tag with the basic information should be applied to the base. The display is inspired by displays often found in record stores for very special records. The records are standing on the shelves in an approx. 10 degree angle to the wall, and the distance from one record to the next is 1/2 inch. The vertical distance between rows is approx. 1/2" from the edge of the record, total 13". The field on the wall (ca 39x39") defined for the 9 (3x3) records should be painted black. The order is given by the dates of death, starting with Billie Holiday (dead in 1959), and ending with Grover Washington (dead in 1999). The order is from left to right, top to bottom. -the word "LIVE" must appear on the sleeve. It is not necessary that the name of the artist is printed. -If more then one LIVE record exists by certain artists, one has to be selected against the others-each artist can only have on record in the collection. 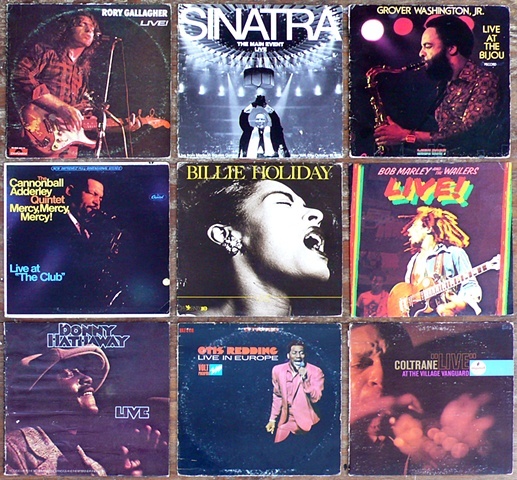 -There are compilation records with several artists on the cover. These records qualify if all artists are dead, or if the majority are dead and there cannot be another record found by the dead artist (for ex: Johnny Cash, Carl Perkins and Jerry Lee Lewis). There is one growing collection that holds the total of all records. However, thanks to the nature of records as multiples, there will also be individual smaller units, like the one for the Birobidzhan museum. These account for autonomous pieces. The collection keeps growing, as long as vinyl records of dead recording artists can be found. This implies the necessary addition of any artist still alive who has ever recorded an album which is meeting the criteria. In fact, a parallel collection of these is already in working progress. The institution or collector acquiring the LIVE/DEAD collection agrees in a separate contract to pay the artist a certain modest amount for each additional record in order to cover the original purchase and the research. It is also possible for the collector to purchase qualifying records themselves or to contract a third party. However, each record must be verified and agreed upon by Christoph Draeger. Born in Switzerland, Christoph Draeger studied at Ecole Superieure des Art visuels de la Cambre, Brussels and School of Visual Arts, Luzerne, Switzerland. In 1996/7, he moved to New York on a one year-scholarship in the International Studio Program at P.S 1, Institute for Contemporary Art, Long Island City. Draeger is an international artist whose conceptual projects take form in installation, drawing, sculpture, video, and photo-based media to explore issues pertaining to disaster and media saturated culture. His work has been exhibited with galleries and institutions world-wide: Paco das Artes in Sao Paulo/Brazil, Kunstwerke in Berlin/Germany, Kwangju Biennial, South Korea, Centre Pompidou in Paris/France, Kunsthaus Zurich/Switzerland, Moscow Biennial/Russia, Union Gallery in London/UK, the Liverpool Biennial/UK, Orchard Gallery in Derry (Northern Ireland), Alcala 31 in Madrid/Spain, Carillo Gil Museum in Mexico City among others; as well as at the Brooklyn Museum, the Whitney Museum and Roebling Hall in New York, San Francisco and Los Angeles. Draeger’s work is in the collections of the Whitney Museum of American Art, New York, the Brooklyn Museum, New York; Kunsthaus Zurich, Switzerland; and Centre Pompidou, Paris, France. He is represented by Catharine Clark Gallery in San Francisco, Y Gallery in New York, Magnus Muller Gallery, Berlin, Luciano Fascati, Chur (Switzerland) and by Galerie Anne de Villepoix in Paris.